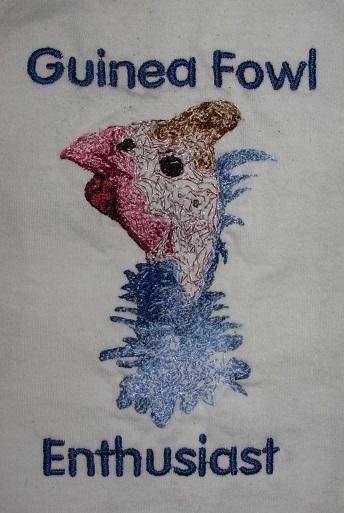 One embroidered "Guinea Fowl Enthusiast" white T-shirt with Guinea Fowl embroidery, as shown, on left chest. Winner must choose one size from sizes S, M, L, XL, XXL, XXXL. Embroidery is rare - the artistic interpretation of the image of one of our birds. His name is "Blue" and he is a four-year-old Coral Blue. Embroidery is amateur quality -- just for fun -- was trying to catch the "Guinea-vibe." Used high-quality isacord embroidery threads. Safe to machine wash and dry like any other cotton T-shirt. Comes pre-washed and ready to wear. Optional addition of your name or a reasonable amount of text on the right chest of the shirt. Free shipping to continental US is included. Will be stitched and mailed within two weeks after receipt of winner's address, size, and optional text request. 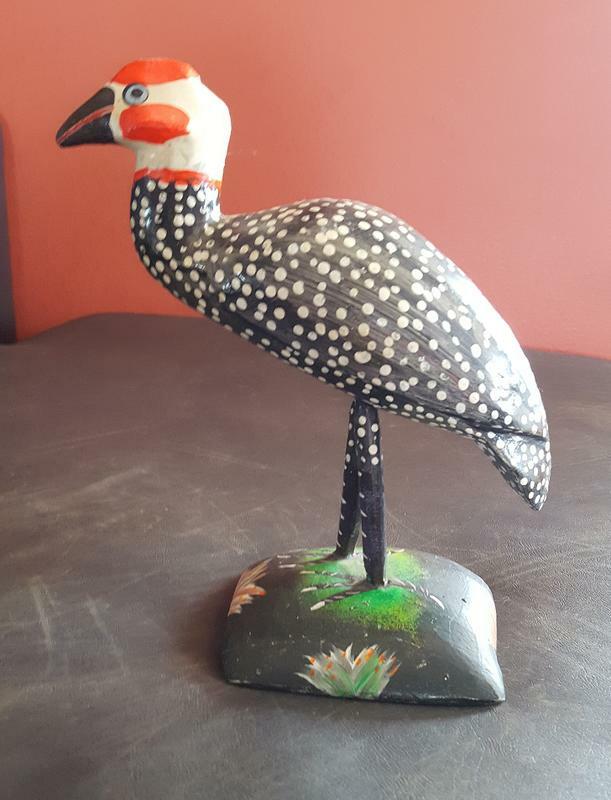 This whimsical primitive-style folk art guinea fowl is from unknown origin, but it belongs in your guinea fowl art collection. The kingdom of Lesotho is known for its hand-woven mohair carpets and tapestries. 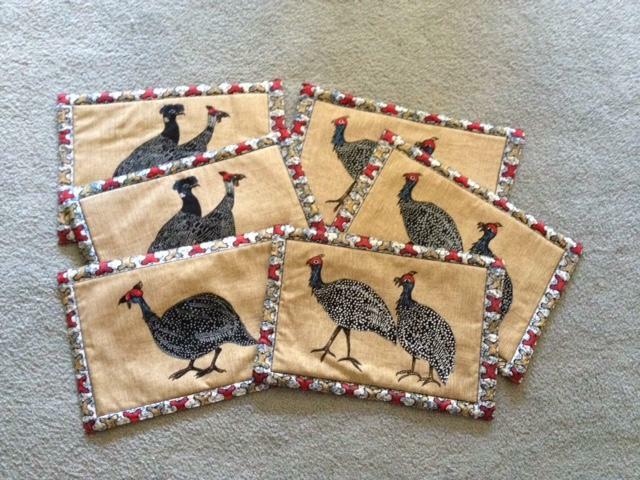 This woven wall hanging from Lesotho is 16.5" by 21" including fringe. There are three tabs at the top. 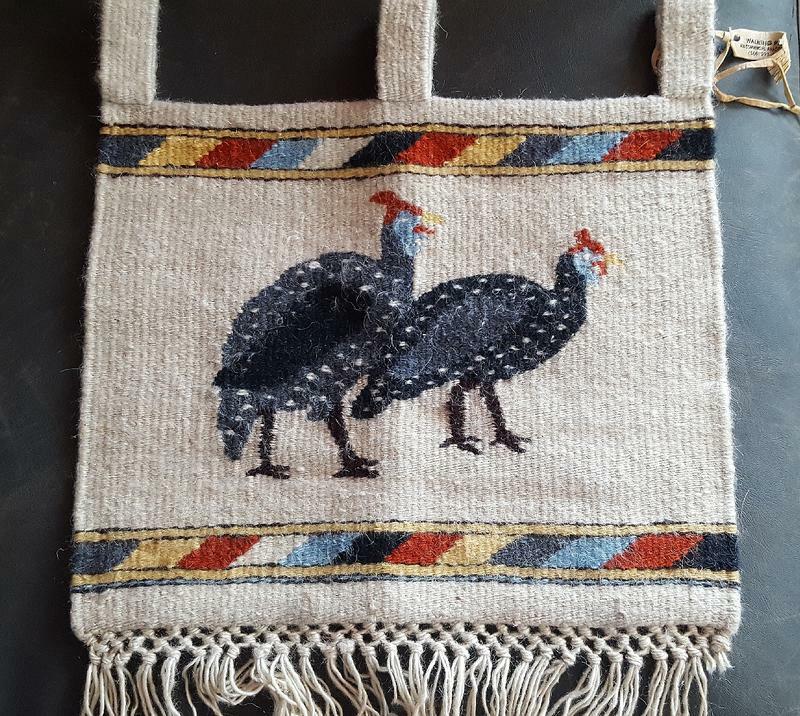 This woven wall hanging has the same design on the back side, but the two guineas are facing to the left. Bread dough art. 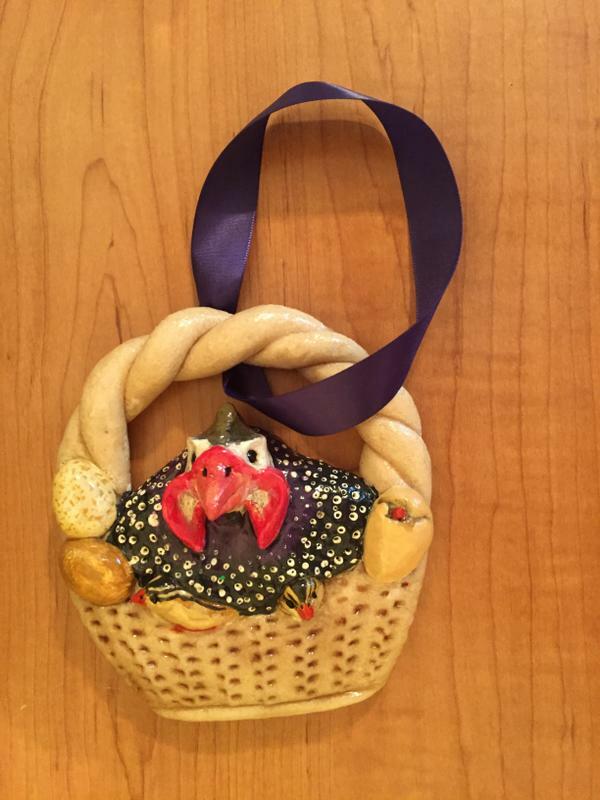 Piece is 5" high x 5.5" wide and fashioned from bread dough by the artist Bennie. There's mama guinea in a basket and there are newly hatched keets, along with a hatching keet and two eggs. Basket hangs from a purple ribbon. Bread dough art. 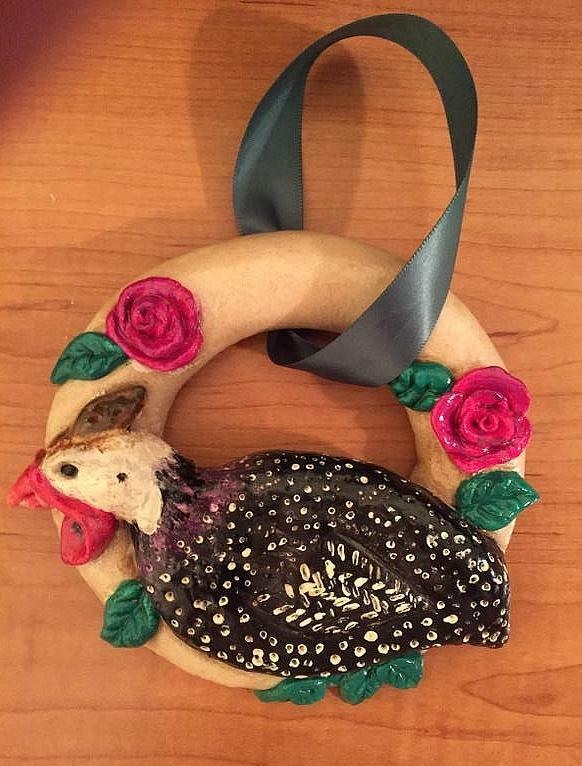 Piece is 6" wide by 5.5" high and fashioned from bread dough by the artist Bennie. The guinea is surrounded by bright red flowers and bright green leaves. The piece hangs from a green ribbon. 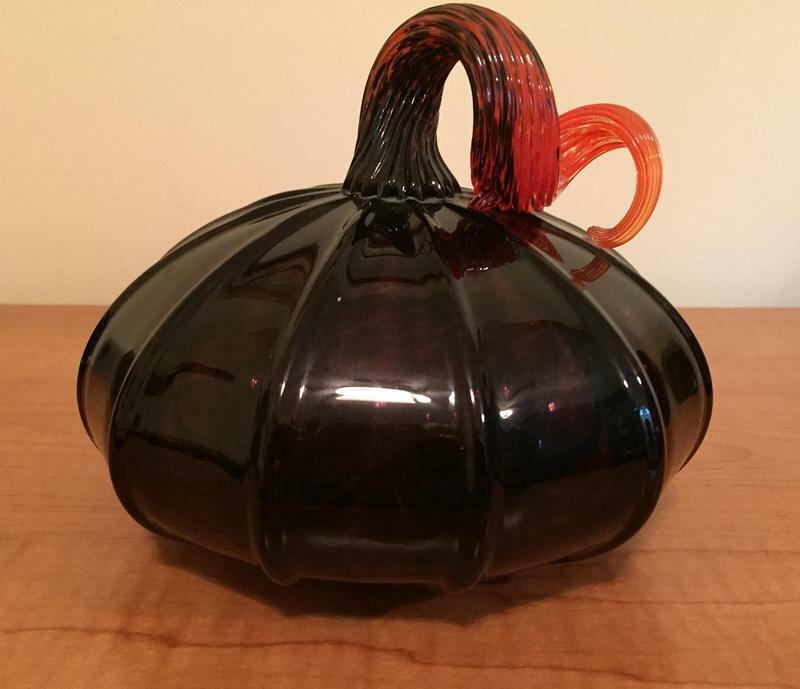 Glass pumpkin crafted by the glassblowers at STARworks in Star NC. Color is blue -- or is it blue? (This pumpkin changes subtly in different light.) Height including stem is seven inches; width is six inches. 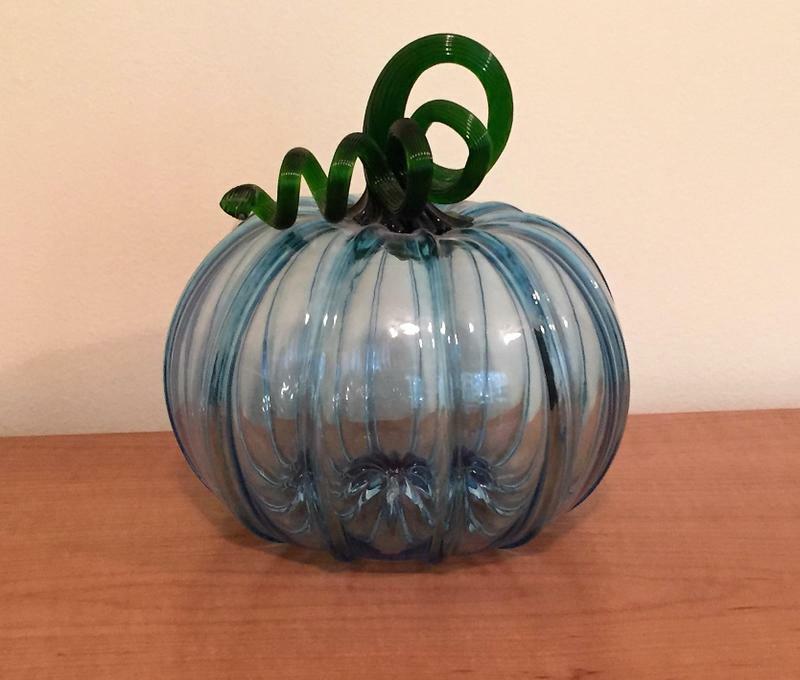 One-piece glass pumpkin crafted by the glassblowers at STARworks in Star NC. Height including stem is 5.5 inches; width is 6.5 inches. 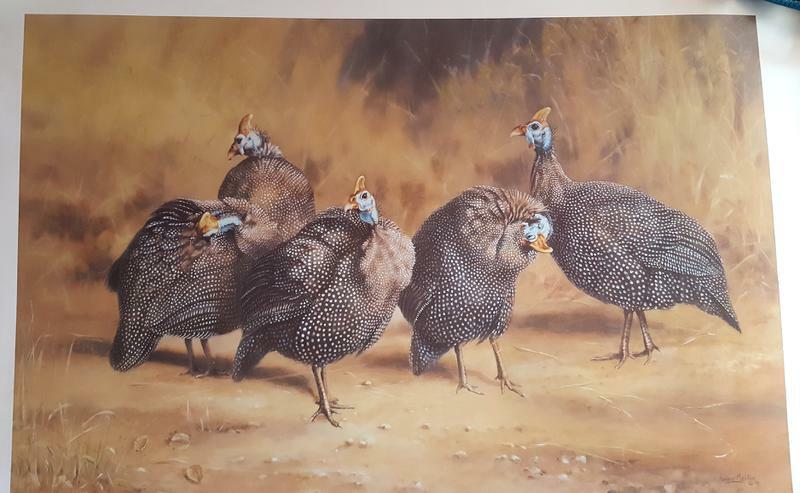 Penny Meakin Print: "Quiet Time"
Guinea fowl preening print by Penny Meakin is limited edition #578 of 1000. Size is 25"x36" (includes border). Print is unframed. 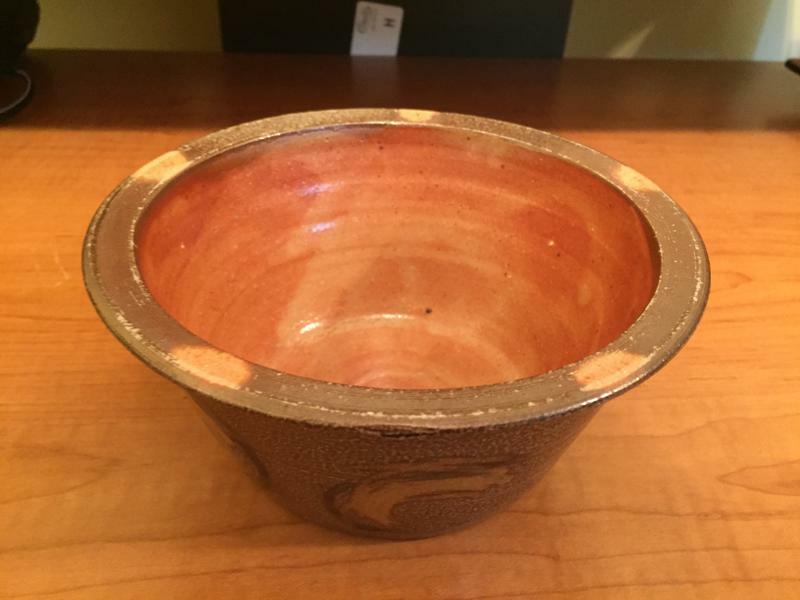 Pottery Bowl: North Carolina clay, with multiple slips and shino glaze. Wood fired and salt glazed in July 2016 at the NC Pottery Center in traditional southern Groundhog style kiln. Marks on rim indicate pot was stacked in kiln. Top diameter is 6.5"; diameter of bottom is 4"; height is 3". Potter is Josh Floyd. Bowl was purchased from the potter and donated by Halfspied. 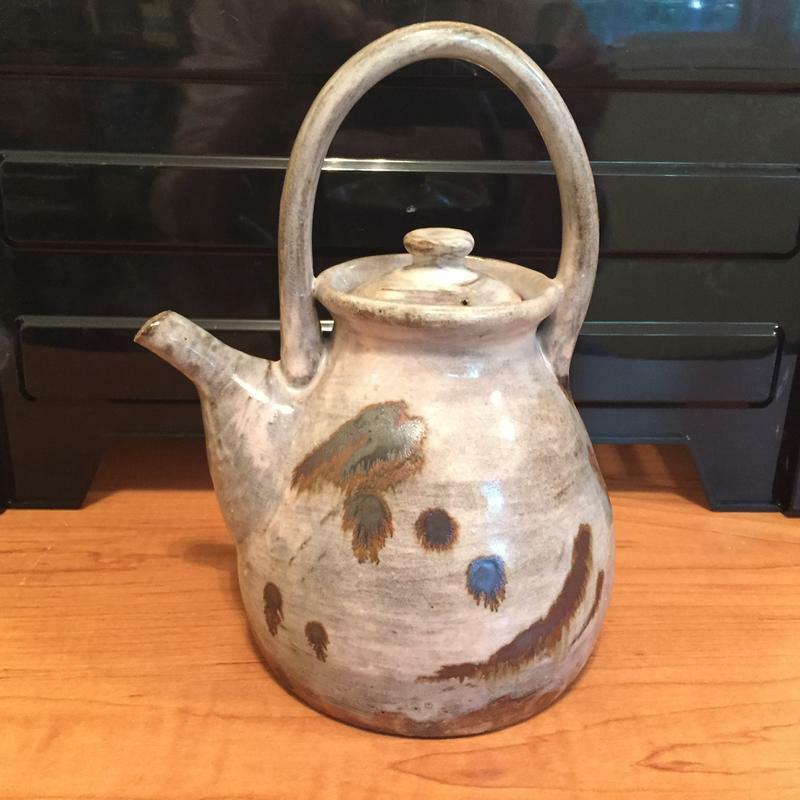 Teapot was purchased by Halfspied and donated to this auction. 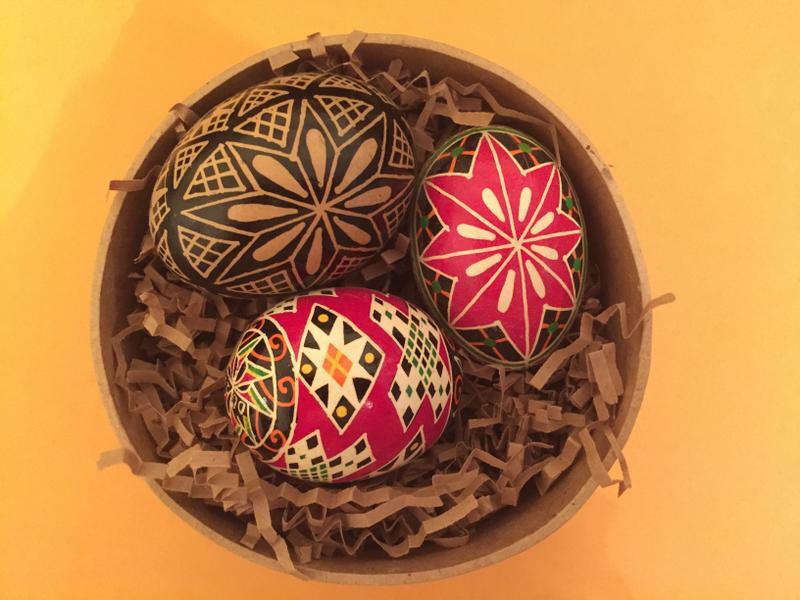 Pysanky eggs are the product of a Ukranian craft in which eggshells are decorated with traditional Ukranian folk designs. 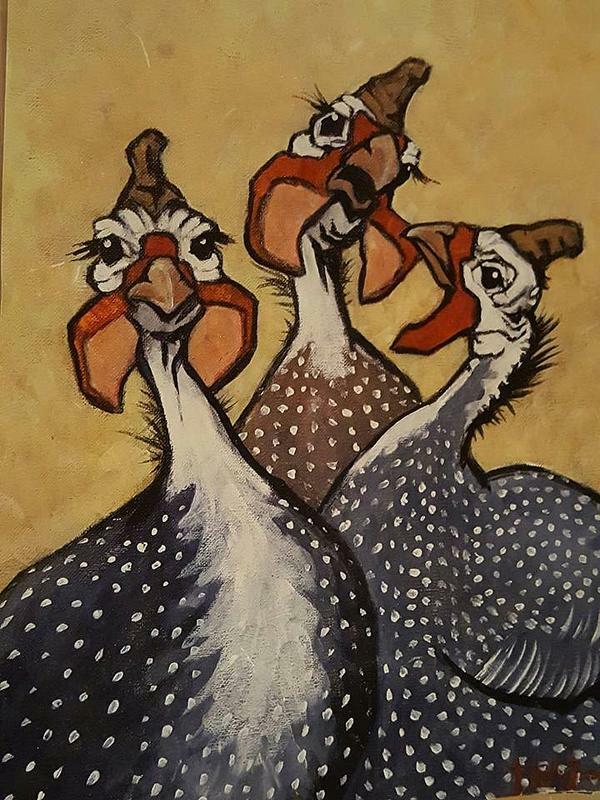 These three were painted by Denise and Andrea DiGeronimo in Ohio. Just lovely. 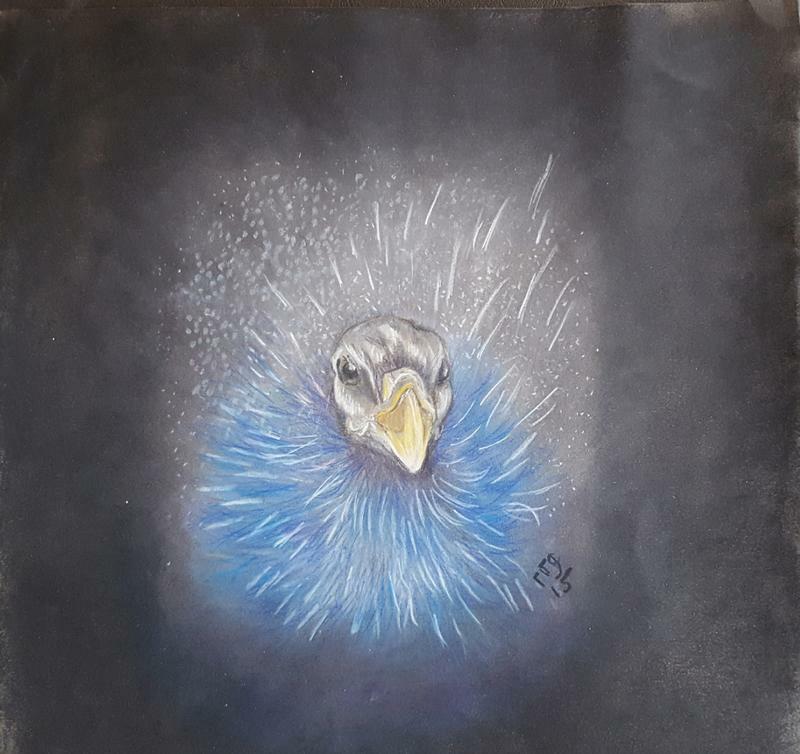 Robin Gorton Pastel: "Vulturine Hybrid - Jane"
"Vulturine Hybrid - Jane" - an original Robin Gorton Pastel. 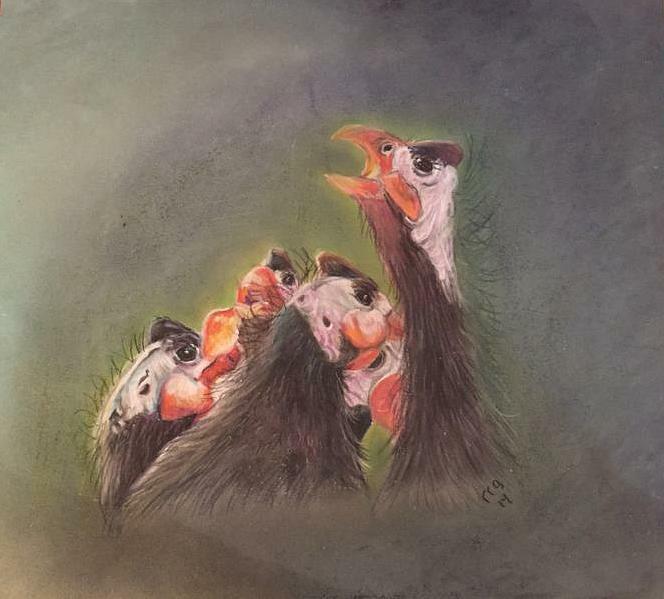 Measures 12" x 12" Unframed. With proper care, this pastel portrait will last for several lifetimes. Pure, bright hues will not change or yellow. 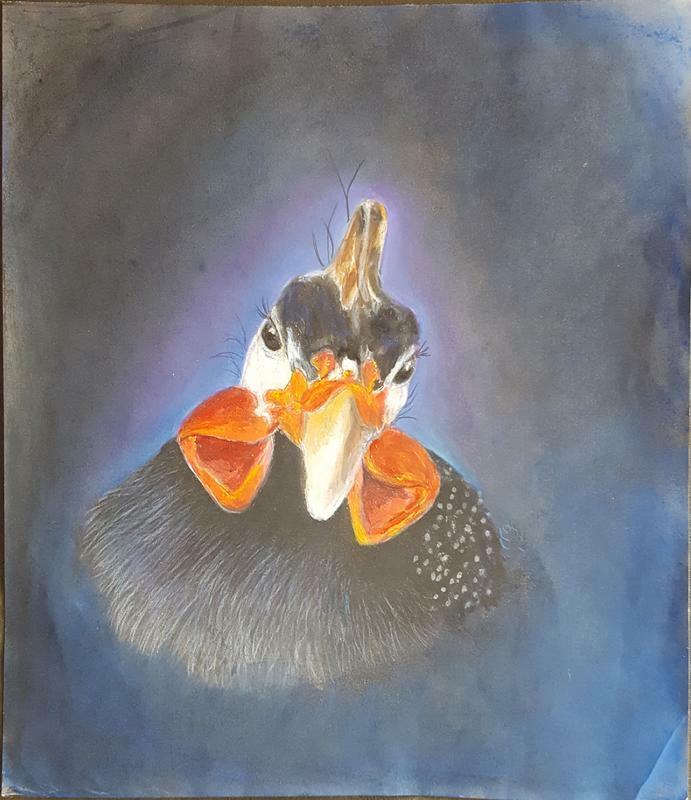 Robin Gorton Pastel: Another "Guinea Portrait"
Another "Guinea Portrait" - an original Robin Gorton Pastel. Measures 12" x 14" Unframed. 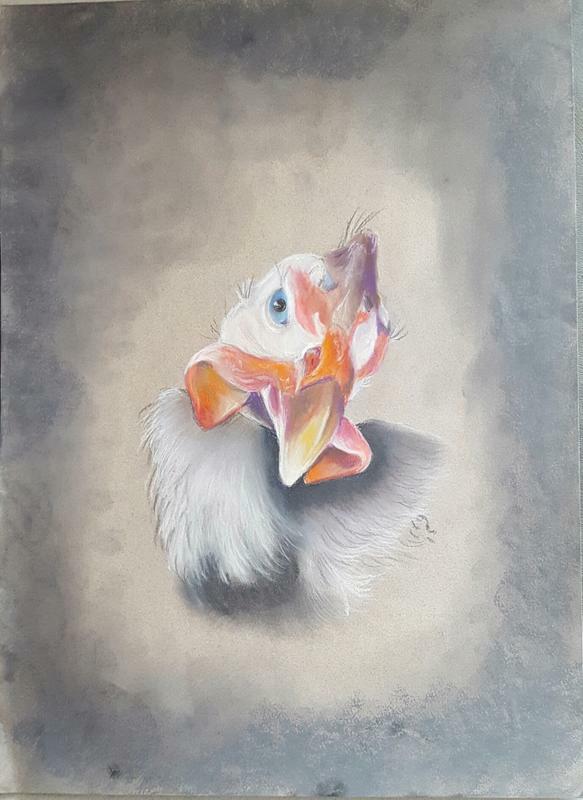 With proper care, this pastel portrait will last for several lifetimes. Pure, bright hues will not change or yellow. 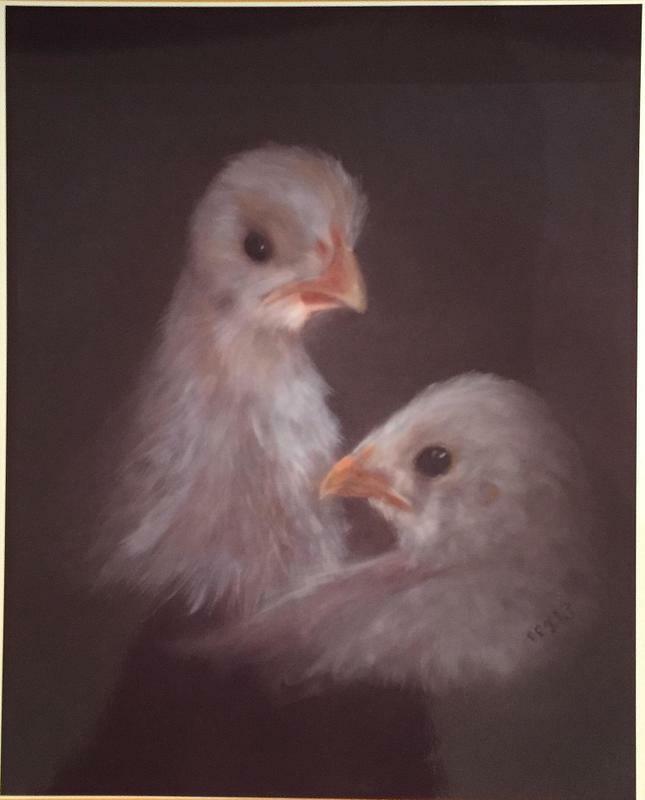 There is a small crease in the lower right corner, but it should not be visible when matted and framed. 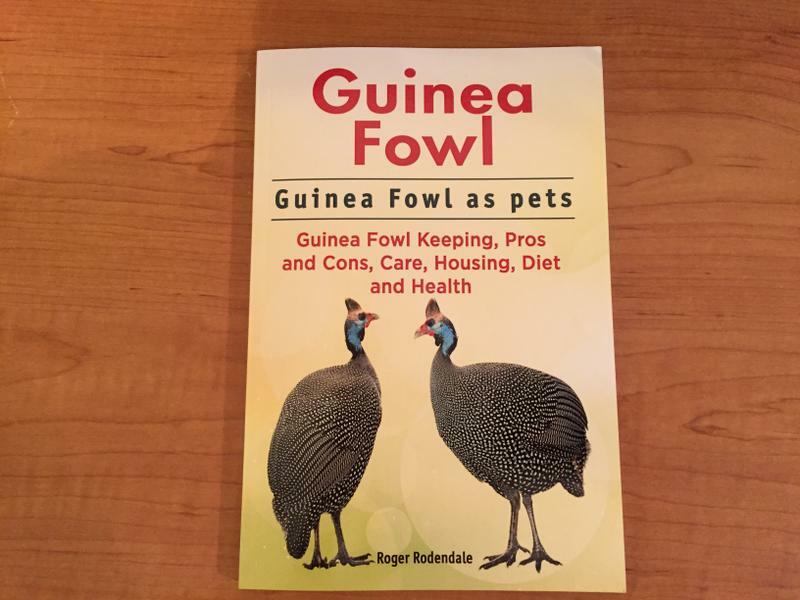 Guinea Fowl as Pets: Guinea Fowl Keeping Pros and Cons, Care, Housing, Diet and Health by Roger Rodendale, 120 pages, published 2016. Book will be shipped postage-free to winner. 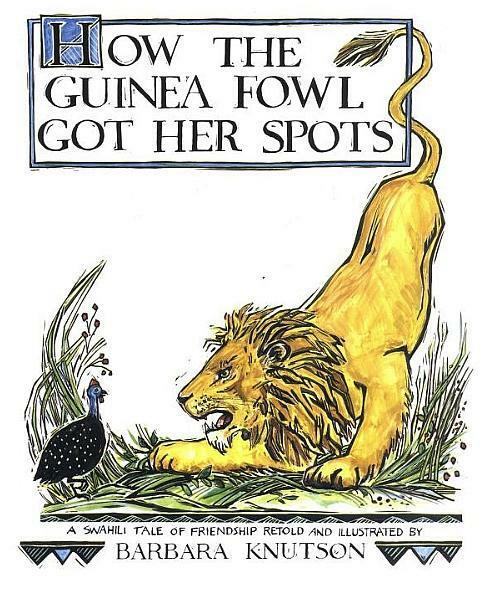 How the Guinea Fowl Got Her Spots - A Swahili Tale of Friendship for children or the child in you. Winner of the 1992 Anne Izard Storyteller's Choice Award. Free shipping in the continental United States. Donated by BennIe. 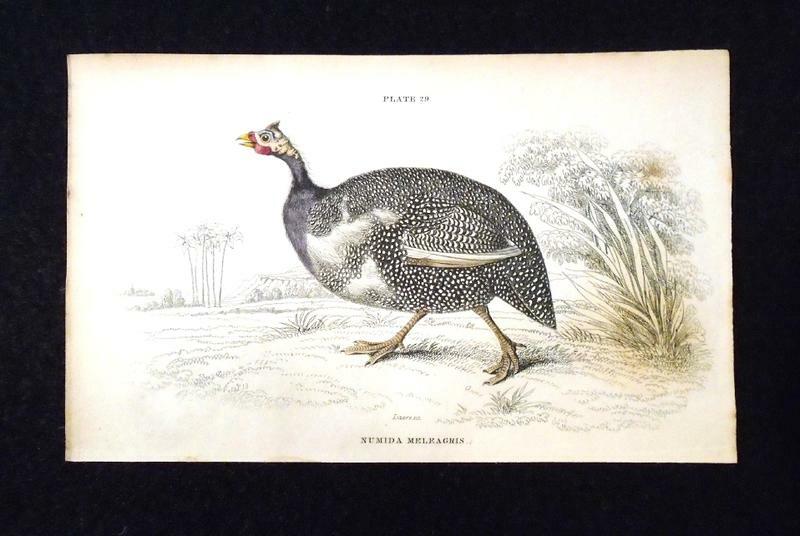 Many consider the guinea fowl a delicacy, and here is a cookbook en francais for them. 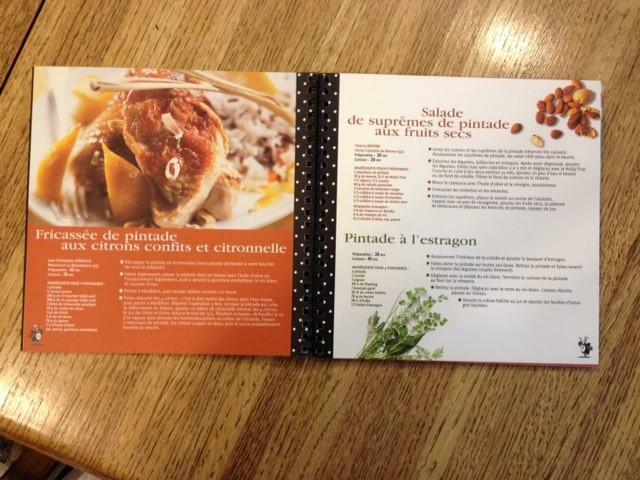 Il y a 36 recettes epatantes de pintade (36 sensational guinea fowl recipes). 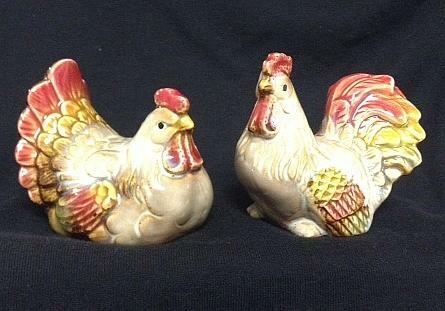 These colorful ceramic salt and pepper shakers are 3" x 3". 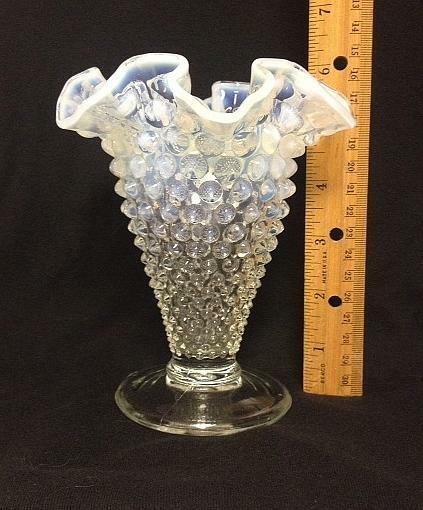 Fenton or Fenton-style covered bowl. Bowl has a basket design. 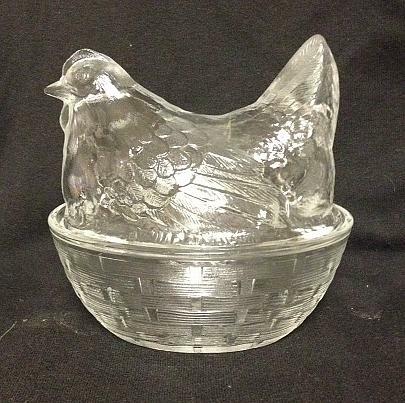 Hen lid sits on top of bowl. Together the two pieces are approximately 5"x5"x3.5. There are some hard-to-read markings on the bottom. 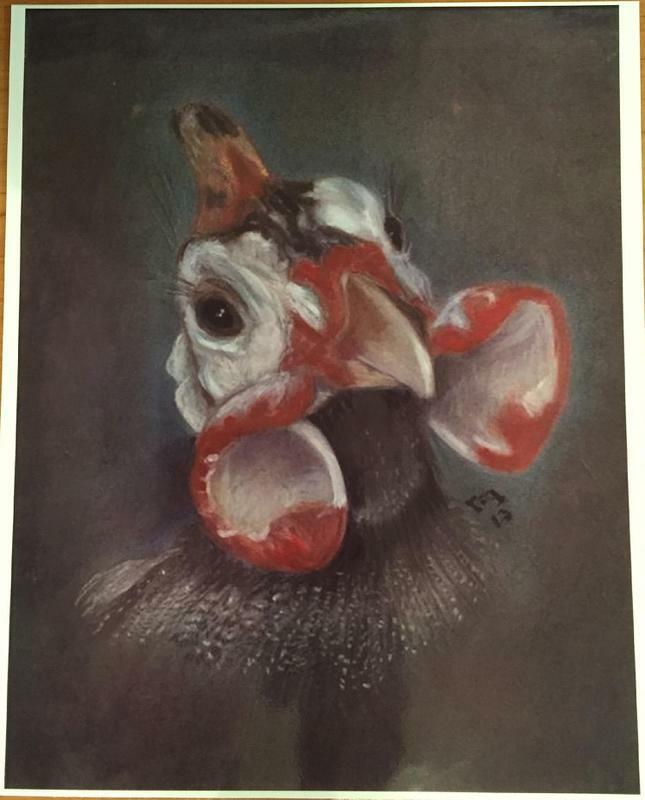 This attractive piece was donated by Zoe Howland. 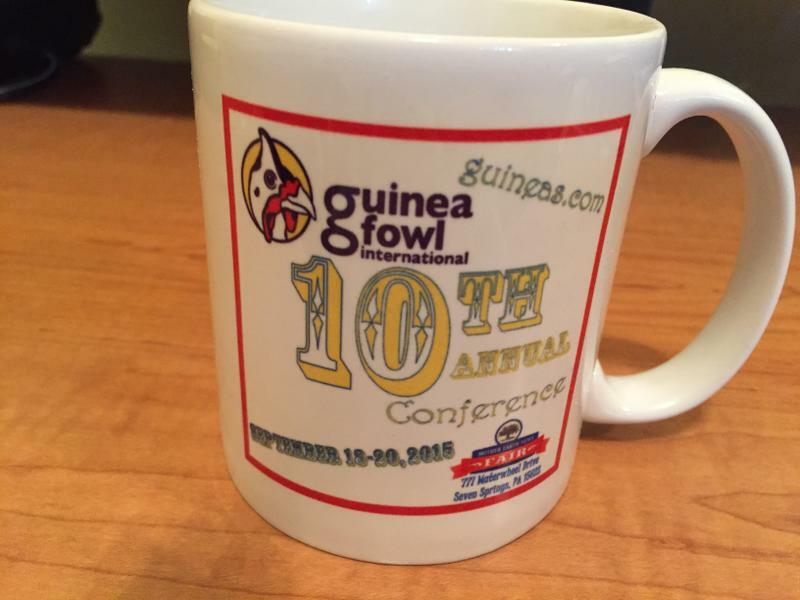 Mug commemorates our 10th annual conference last year at the Mother Earth News (MEN) Fair in Seven Springs PA. In 2015 we also switched to a new format for our meetings that facilitates planning and execution of the event. We went one step further and began to take part in MEN Fairs in other locations. If we have members in the area who can take guineas and keets to the Fair, we'll sign up to be exhibitors and presenters. As such we interact with thousands of guinea owners. It's a win-win. Logo and website are on the other side. Mug is 3" in diameter and 3 1/2" tall. 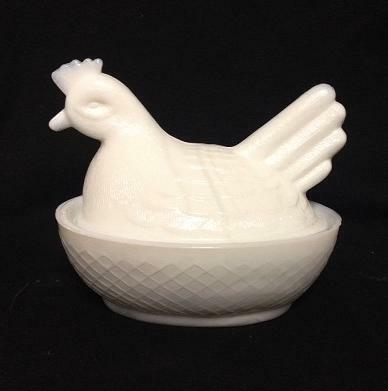 From the seventies, this ceramic item can be a vase or a utensil holder. It's in very good condition -- ready to use or display. It's 5 1/2 inches tall by 4 1/2 inches wide. Hen top fits in the top of a criss-cross design nest. Approximately 5" x 3.5" x 2.5". 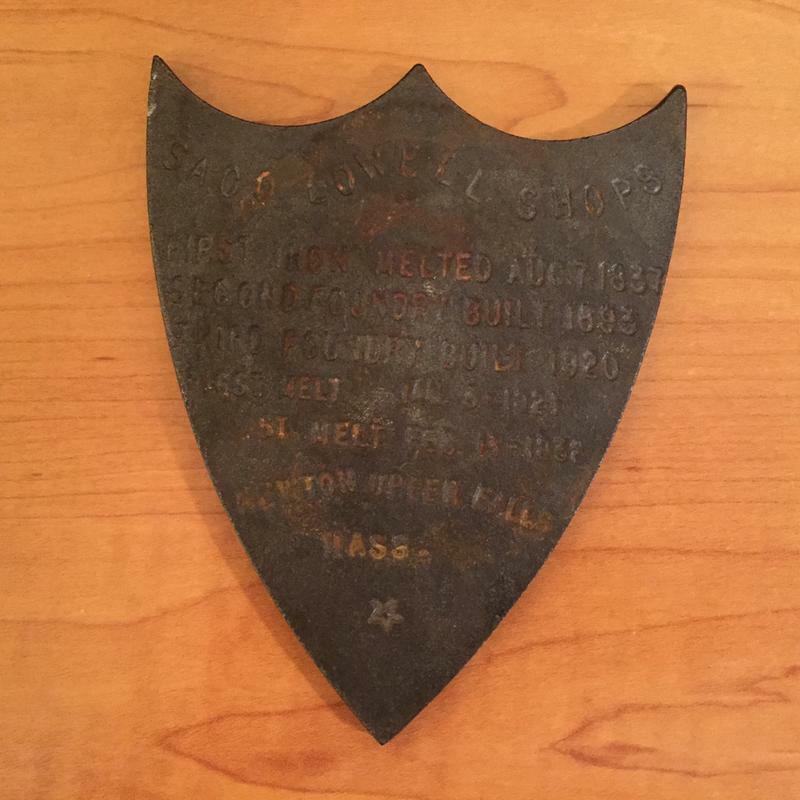 No markings on bottom. 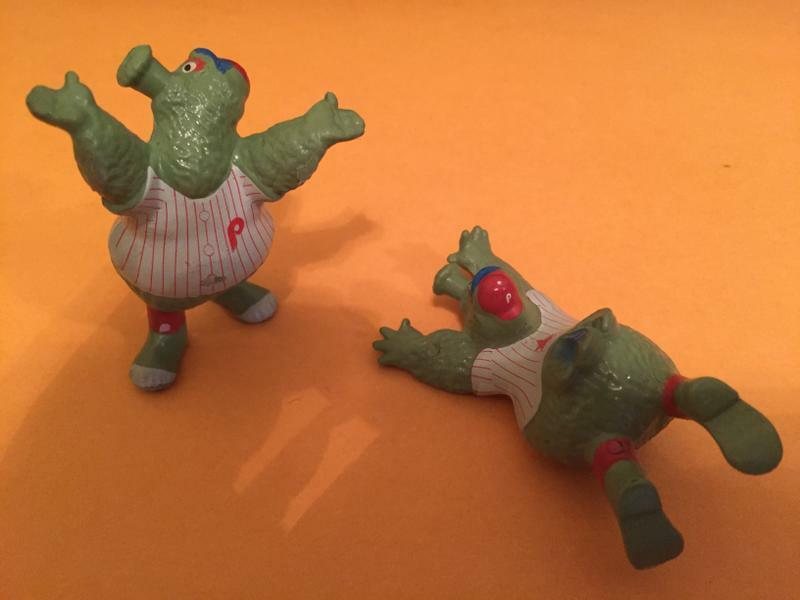 Sports Memorabilia rescued from a box they've been in since the 80s -- these two Phillie Phanatic (Phigures?) are ready to play -- or display. One stands a little over 2 1/4 inches. The other appears to be sliding into base and is about 3 inches from fingers to toes. They are made of a rubber-like composite material. Shipped at no cost to the winner within the US and Canada. 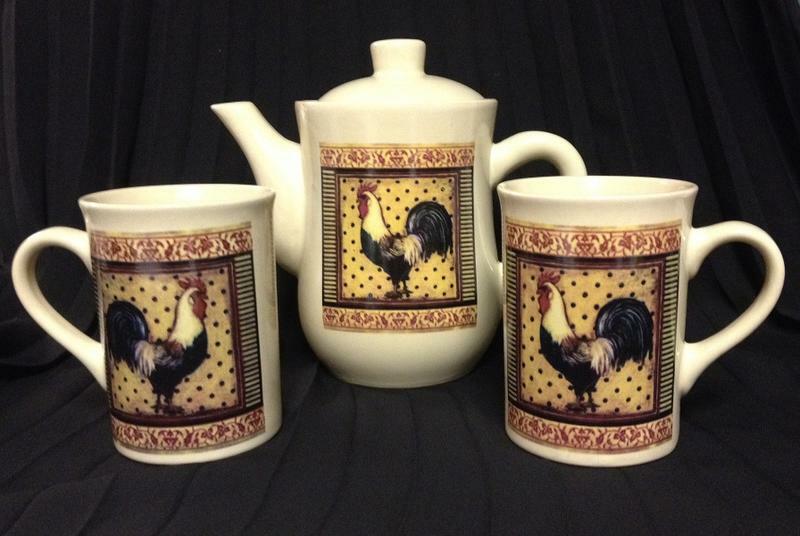 This is an attractive teapot (or coffeepot) and two cups. Marked on the bottom with the following information: Dishwasher and Microwave safe; Made in China, and Bay Island, Inc.
Bay Island products are considered collectable. This is an interesting Fenton-like, or possibly Fenton, encompassing these elements: trumpet shape, hobnail, opalescense, scalloped top. We know this piece is over 35 years old and that it may be several years older. 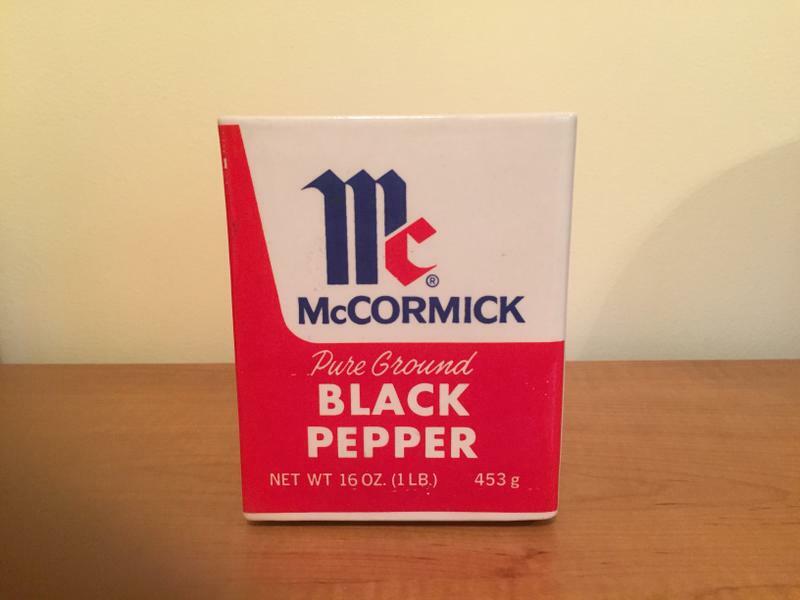 It is approximately 6" x 6". It has no markings. 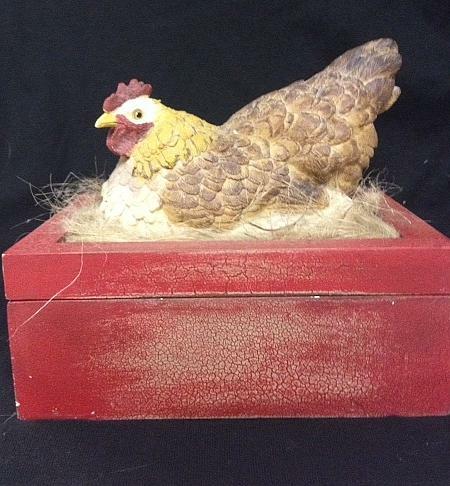 Red wooden box with hen on top. Approximately 6"x6.5"x5". Box is 2" deep when chicken lid is lifted off. 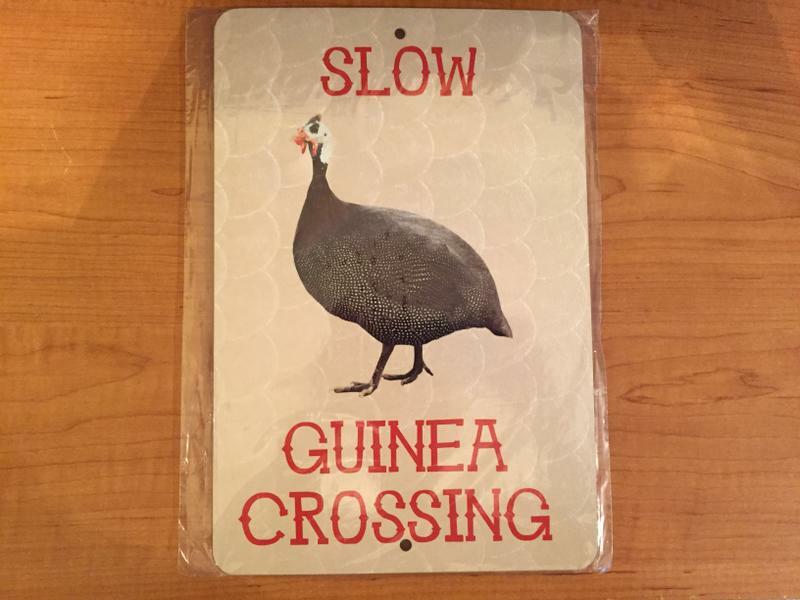 A single 8" x 12" "Slow Guinea Crossing" sign for outdoor/indoor use. 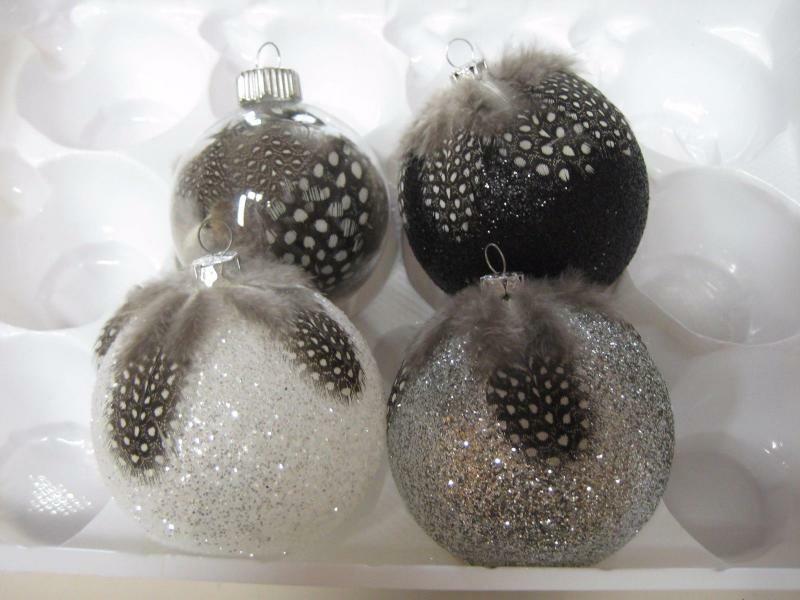 Designed and manufactured by Louise's Country Closet in Garrison, MN, USA. Made of aluminum (will not rust) with a high gloss UV coating that is resistant to fading. Inks are set in - no paint to peel or scratch off. Free shipping to continental U.S. $5 shipping elsewhere. 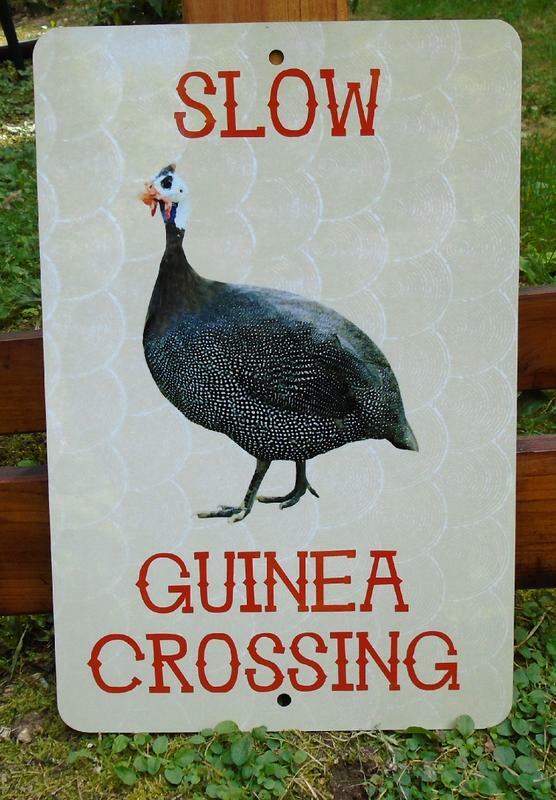 8" x 12" "Slow Guinea Crossing" signs for outdoor/indoor use. 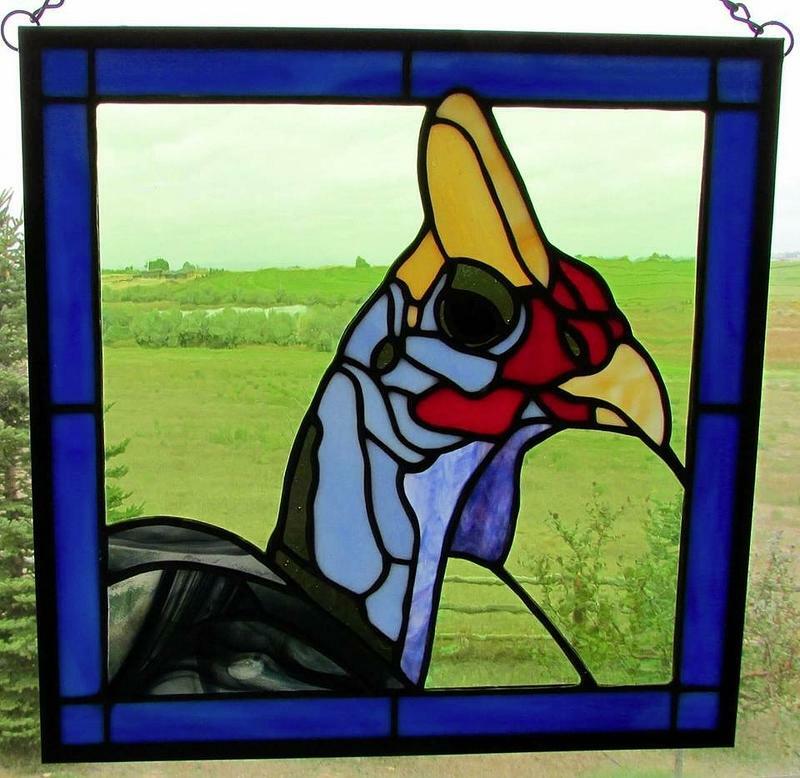 Designed and manufactured by Louise's Country Closet in Garrison, MN, USA. Made of aluminum (will not rust) with a high gloss UV coating that is resistant to fading. Inks are set in - no paint to peel or scratch off. 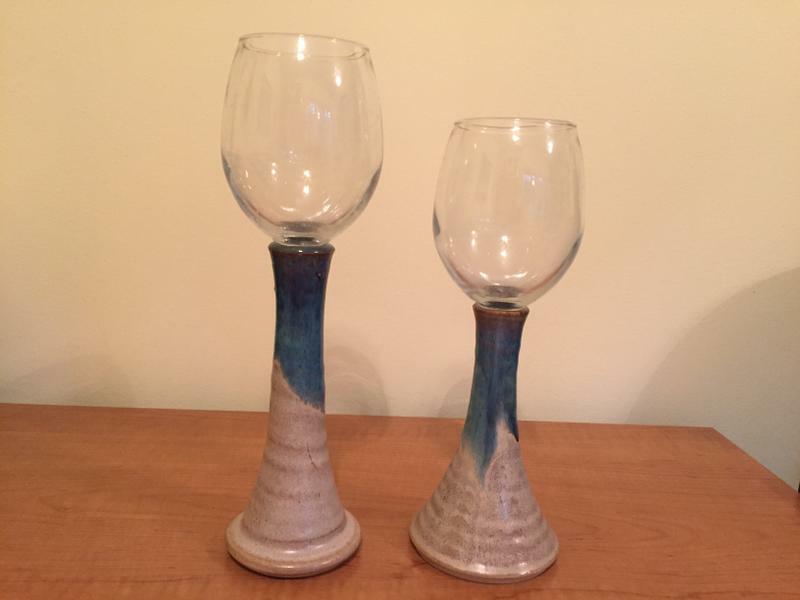 North Carolina Pottery His and Her Wine Goblets: crafted with standard wine glasses and pottery stems and bases. One is nine inches tall and the other 10 1/4". From Lantern Hill Pottery in Seagrove NC. 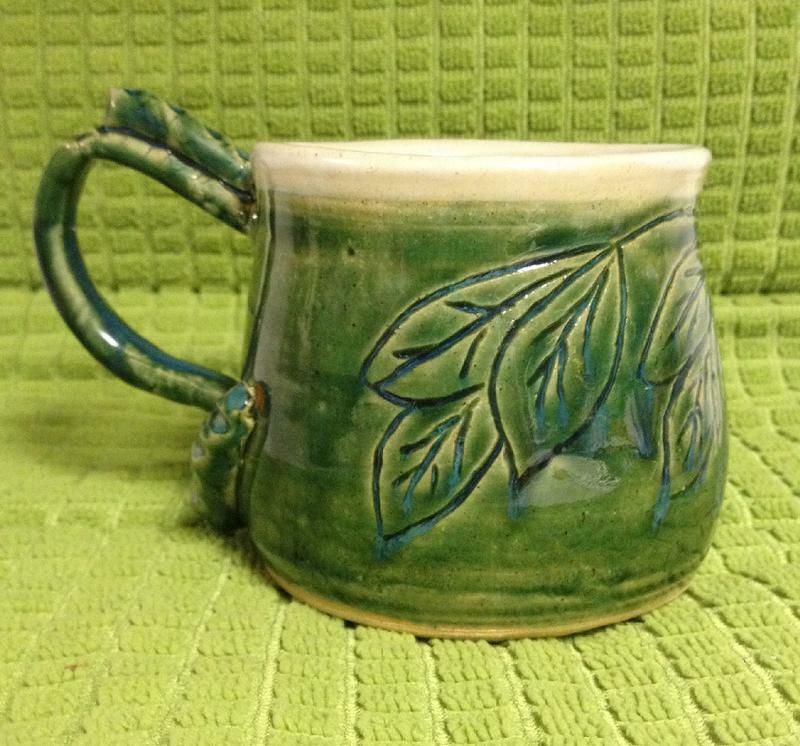 This is a new pottery mug decorated with a leaf detail. It has a turquoise base with a green wash over it and measures 4.5" tall by 6.5" wide including its unique handle. 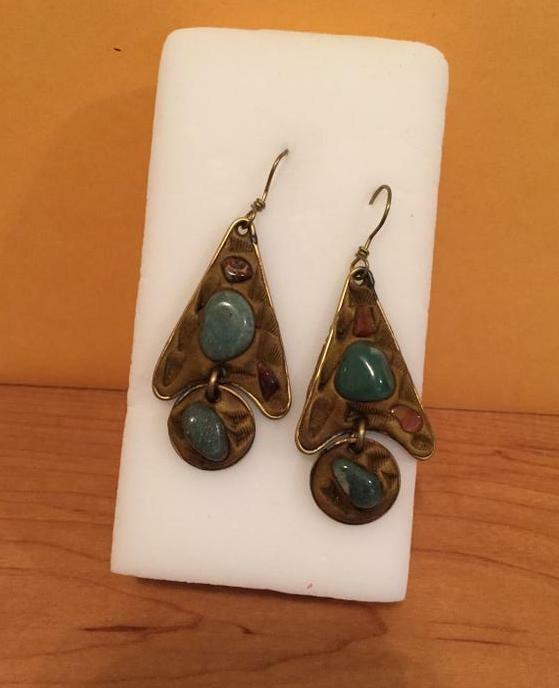 New earrings: polished stones in a composite material. Earrings are seven centimeters (approximately 2 3/4 inches) from the tippy top to the bottom. Each earring weighs less than one-half ounce.